Mix some white lightweight clay (Hearty) with a very little amount of ochre colour acrylic paint to get a pale ‘dough’ colour. You can also use Mermaid Puffy Chocolate to make a chocolate pastry instead. Grease heart tart mold with a layer of Mold oil (Padico). Gently fill the mould with clay and remove carefully. Texture the surface of the ‘pastry’ using a toothbrush. Tap softly all over the surface. Use pastels to shade the ‘pastry’. Start with the lighter pastel colour first which is ochre, then layer with brown and dark brown. This will give your pastry a ‘baked’ look. 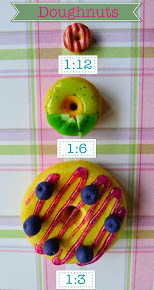 To make the 'pastry' look even more real, use alcohol inks or diluted acrylics to further paint the outer crust. Make a strawberry mixing translucent white with a very little amount of translucent red. Shape them into strawberries and poke the top using a cocktail stick. Use a needle to poke as many dents as you can on the surface. After baking the strawberries, colour it with red alcohol ink or acrylic paint. Add some adhesive putty on the end of a cocktail stick to stick the strawberry to paint it more easily. Make some tiny blueberries by mixing Carmine Red with Navy Blue polymer clay. After baking the blueberries, you can also coat them in fake sugar. Dip the blueberries into PVA glue and carefully roll into the fake sugar and let it set. Cover the tart base with deco icing or deco sauce. Let it dry and set. Use the small nozzle attachment and carefully pipe out stars onto the pastry. Make sure you have your strawberries and blueberries ready before you start piping. Carefully place a fruit on each star, alternating strawberries and blueberries. Wait for the silicone to fully dry before handling and serving it to your dolls. Naru is taking the meringue tarte out of the gas oven with care. It can be tricky to make miniatures so make sure you do not rush and be very careful during every step.